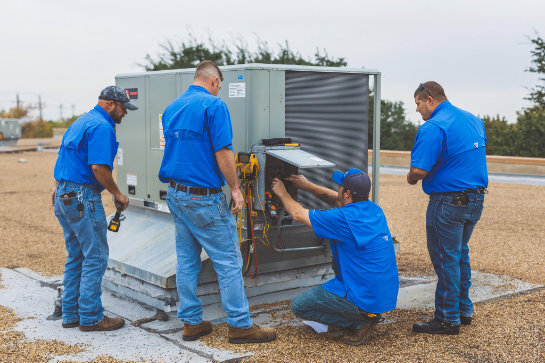 At Perry HVAC, we’re known as the “Roof Top Experts,” and can help your company with new HVAC installations, replacements, and custom jobs of any size. Our expert service engineers can repair both single package and splits systems, regardless of the brand. Keep your cooling and heating equipment in top notch condition with our HVAC preventative maintenance services. What are you waiting for? Call us today at 214-714-6365! Reliable: Delivering on our promise of excellence since 1954. Recommended: Our customers love us & don't mind saying so. Perry Goal: Satisfaction every time. Qualified: Licensed, professional, and experienced. Committed: Locally owned for over 58 years. Perry HVAC is one of our best vendors and we highly recommend them for your HVAC needs. Their rates are economical and their approach practical. They have been so consistent and reliable, we recommend them to all of our Tenants and they are listed on our requested vendors list. Perry HVAC is a valuable service company and we give them our highest recommendation! Authorized dealer for Carrier, Trane, Lennox, York, and Rheem. We service all product lines including American Standard, Bryant, Aaon, Payne, and Goodman.